Skiers and snowboarders searching for snow have a number of free tools available to them via the internet. 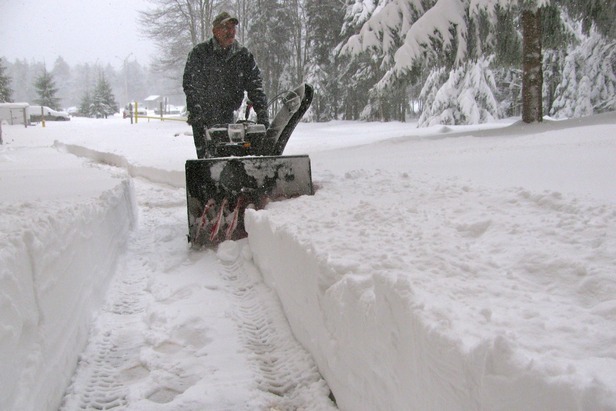 The trick is learning enough about each piece of data to know when it can help you find snow and when to ignore it. This article will talk about the infrared satellite image and how you can use it to find snow. Each satellite has numerous sensors that view the earth in slightly different ways. The infrared sensor peers down at the earth and measures the temperature of the clouds above the ground, or if there are no clouds, then it shows the temperature of the ground itself. Since the atmosphere (usually) becomes colder further up into the sky, clouds that are higher in the sky are colder. On the satellite image, these colder clouds show up as different colors than lower, warmer clouds or even the ground itself. 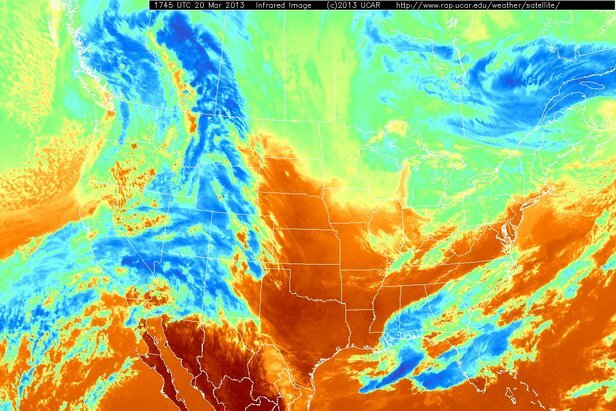 Infrared satellite images detect clouds based on temperatures. In this image, blue areas show colder clouds, which means they are higher in the sky. Red colors show warmer areas, which often means the satellite is sensing the warmer ground with no clouds overhead. The infrared satellite image helps skiers in a few ways. Since the satellite relies on temperature to sense clouds and not sunlight, the infrared image is available 24 hours per day. Since the best time for powder to fall is overnight (so the fresh snow is untouched when the lifts start in the morning), viewing weather data at nighttime is important. A second benefit to this type of image is that it shows clouds with higher tops, which can imply that the cloud is very thick as it stretches from near the ground high up into the atmosphere. Thick clouds often produce the heaviest precipitation, so finding a thick cloud with a high (cold) cloud top can often mean finding areas of heavier snow. Unfortunately there are some limitations with infrared satellite images. The first problem is that satellite images show the tops of clouds, not what is falling beneath them. So looking at a satellite image will not directly answer the question, “Is it snowing?” Second, it is sometimes difficult to know if a cold cloud top means that the cloud is thick (and producing lots of snow) or is a thin wispy cloud producing no precipitation. High, thin clouds often move faster than thicker clouds, and they also might appear “wispy” or “fibrous” on the satellite image. If you see cold cloud tops on the satellite image, remember that they likely won’t be producing precipitation if they appear wispy as this signals that these are thin clouds floating at the height of aircraft. You can now use this quick primer to view infrared satellite images with a well trained eye, but keep in mind that these images are only one tool you should use to look for powder.